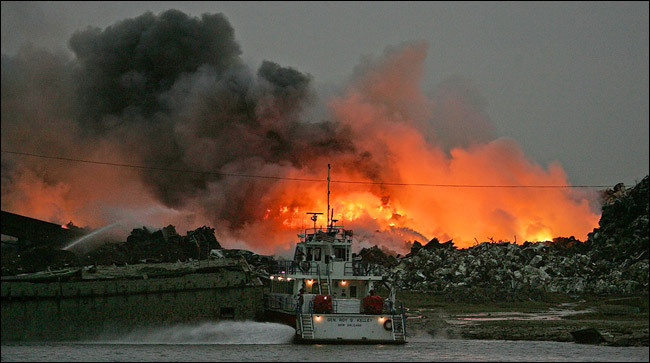 A fire was burning in a 100-foot-high pile of hurricane debris in the Lower Ninth Ward. NEW ORLEANS (AP) -- A smoky fire was burning Friday in a 100-foot-high pile of furniture, refrigerators and other hurricane debris in the city's hard-hit Lower Ninth Ward. The fire, reported late Thursday, covered about 4.6 acres and was largely under control, firefighters said. They were dropping water from helicopters and planned to let the blaze burn itself out. No injuries were reported. The area remains largely uninhabited due to the extent of the damage from Hurricane Katrina's floods. The pile included wood, furniture, water heaters, stoves and refrigerators.